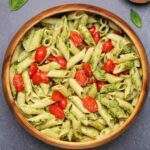 This vegan pesto pasta with pan-roasted cherry tomatoes is rich, saucy, cheesy and packed with flavor. Ready in 30 minutes or less. 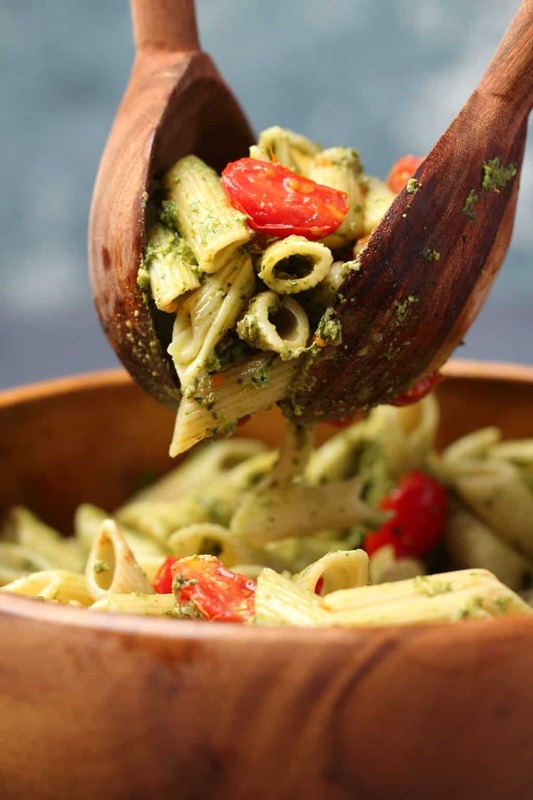 This vegan pesto pasta with pan-roasted cherry tomatoes is a meal to get excited about. Like very excited. It’s beyond easy to make, which is always a good thing. You can have this entire meal ready in 30 minutes or less. And then it’s fun to make too, there’s a few steps involved but all of them are easy, quick and fun. And the result is a very pretty plate of food! I mean look at those colors. Bright green contrasting with the bright red of the cherry tomatoes. 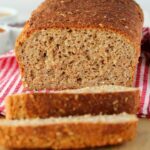 This recipe is really a must-try. Aside from how quick and easy it is, always big draw cards for me, there’s also the fact that it is rich, creamy and cheesy. 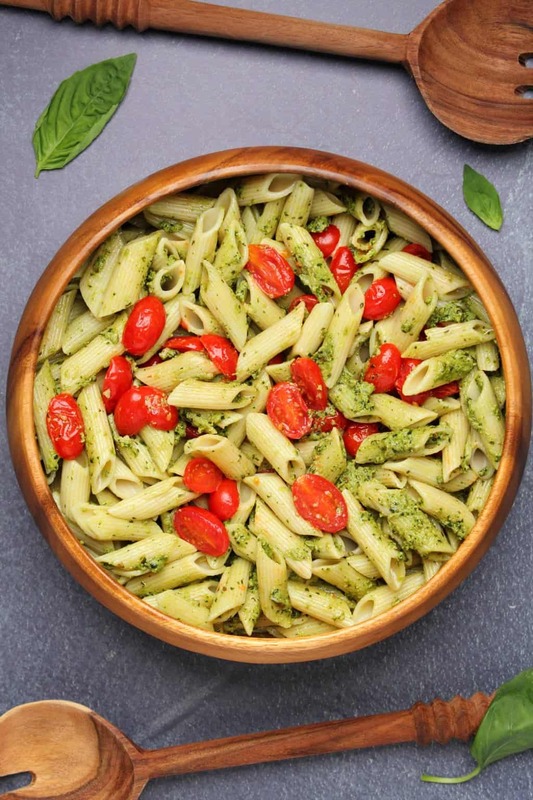 It’s a rich saucy vegan pesto with pan-roasted cherry tomatoes served over pasta. And if that doesn’t sound delicious, I don’t know what does. 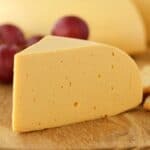 And oh my word you do NOT miss the cheese here. This is cheesy, dreamy, heavenly vegan goodness right here. So to make this, all you do is put on your pot of pasta to cook. While that’s cooking, throw your pine nuts into a pan and lightly roast them for 5 minutes. 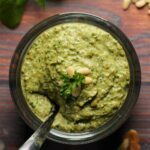 Then toss the pine nuts into a food processor along with some olive oil, green olives, garlic, nutritional yeast, baby spinach and fresh basil leaves and process into a delicious pesto sauce. By that time your pasta is cooked and ready to go. So you mix it all in together with your pesto sauce. Then chop some cherry tomatoes in half and place them into the pan and lightly roast them in the pan for around 5 minutes. Toss them together with your pesto pasta and you’re ready to serve. See what I mean? This could be done in even less than 30 minutes! It’s really quick and easy. This meal serves 4-6 for a fantastically satisfying, rich and delicious dinner. If you add a salad, it will easily serve 6! 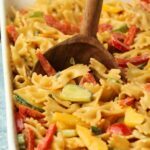 And of course if you prefer gluten-free, then choose a gluten-free pasta. 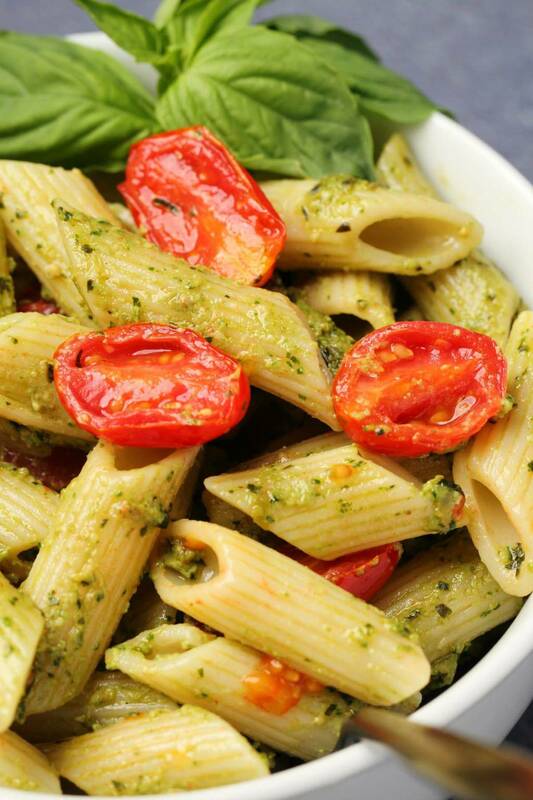 Any pasta will do, but we’re big fans of penne so penne it is! All that and it’s pretty too! And then of course, this is a meal that does not need to be served hot at all, so leftovers? Bring it on! Perfect to take to work for lunch the next day! 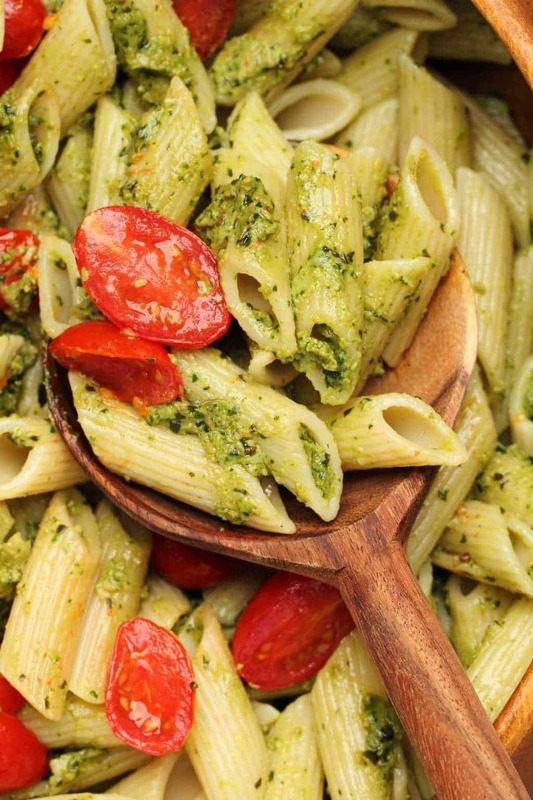 We’re pretty big fans of pesto here, which is why this isn’t our only vegan pesto recipe. 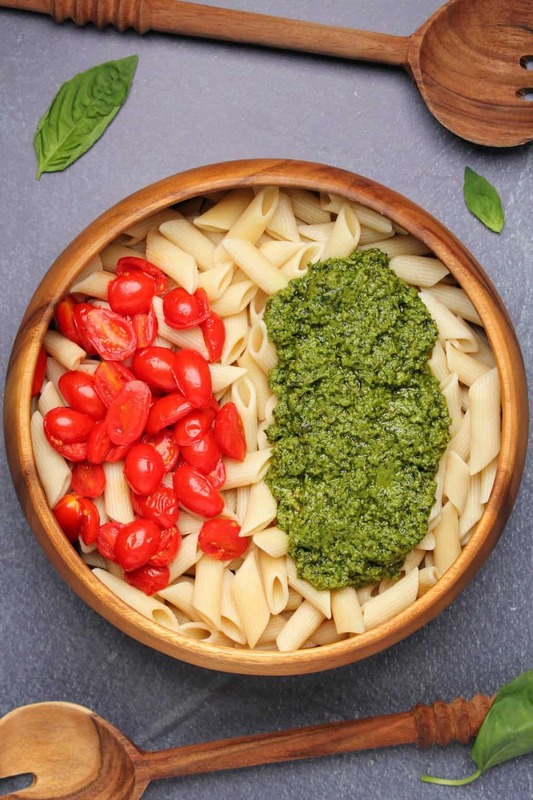 We have another delicious vegan pesto recipe that you might also want to check out, there’s definitely room for more than one pesto recipe in your life I reckon. Questions, comments? Post them down below in the comments section, we’d love to hear from you! And please rate the recipe too, thank you. 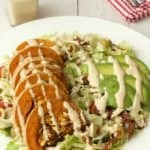 Sign up to our email list for a fabulous (and free) recipe ebook containing 10 delicious vegan dinner recipes and you’ll also be the first to know when new recipes are posted to the blog. Put on the pasta to cook according to package instructions. While that’s cooking, place the pine nuts into a pan and lightly roast them at medium to high heat for 5 minutes, stirring regularly. 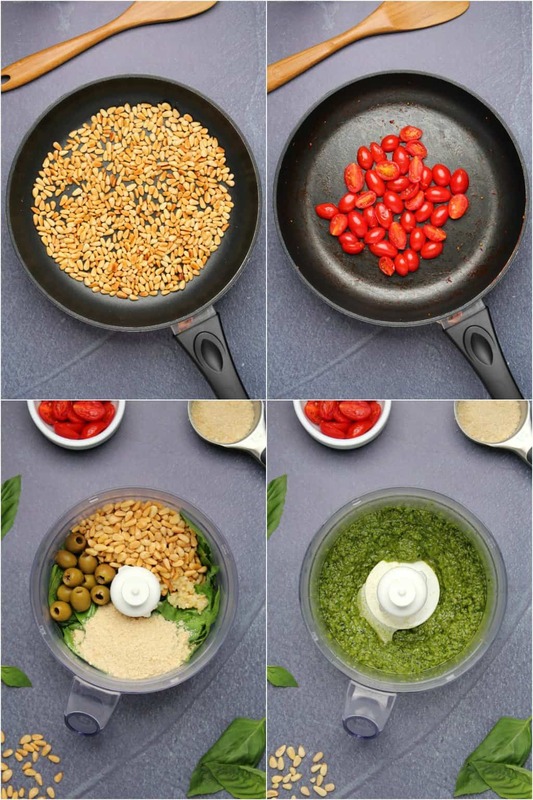 When the pine nuts are nicely roasted, put them into the food processor along with the olive oil, green olives, garlic, nutritional yeast, basil, baby spinach, salt and pepper and process into a paste. Taste test and add more salt and/or pepper as preferred. Slice the cherry tomatoes in half (sliced lengthwise) and place them into the pan and lightly roast them for around 5 minutes. 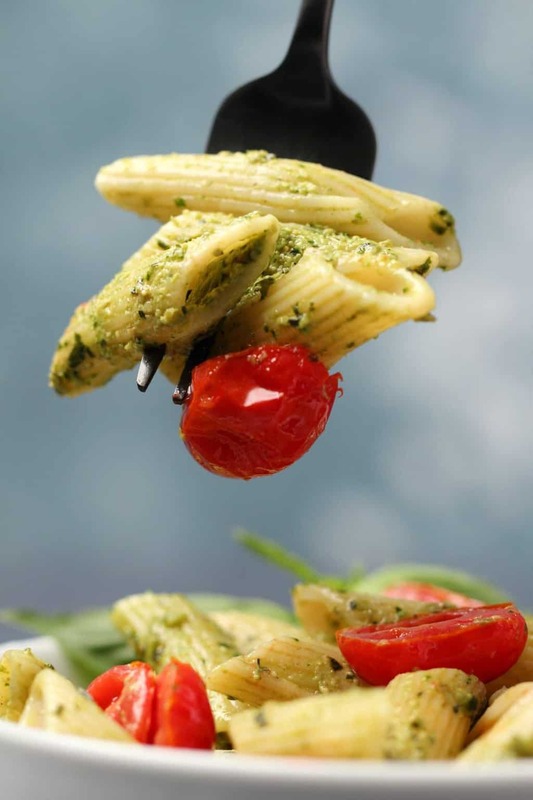 Pour the pesto sauce over the cooked, drained pasta, add the roasted cherry tomatoes and toss together. 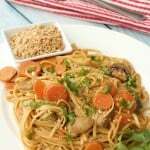 *Nutritional information is for 1 serve of 6 including everything, pesto sauce, pasta and pan roasted cherry tomatoes. 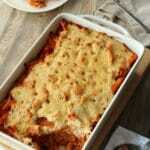 *This recipe has been updated with new photos, but the recipe itself is unchanged. 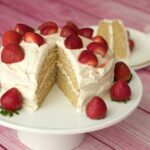 This is so good and so easy! I’ve made this multiple times and it’s always a favorite of everyone. 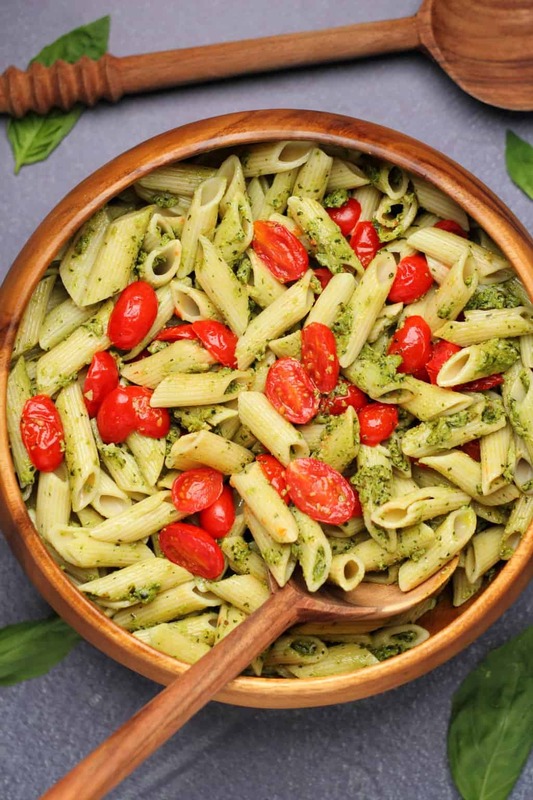 I’m lazy so I use store-bought vegan pesto (I get mine from Whole Foods), so it’s basically roasting tomatoes, boiling pasta and adding the sauce. Crazy easy. 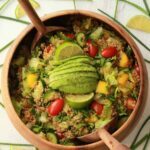 This looks delicious and I can’t wait to try it tonight! This was absolutely amazing. I’m not even a pasta person! I made it as a trial run for a dinner coming up, we ended up eating it for breakfast, and it exceeded all my expectations. Simply mouthwatering!!!!! Love, Love, Love! 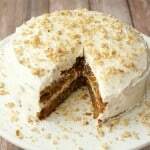 Thank you for sharing all these amazing recipes!!! !